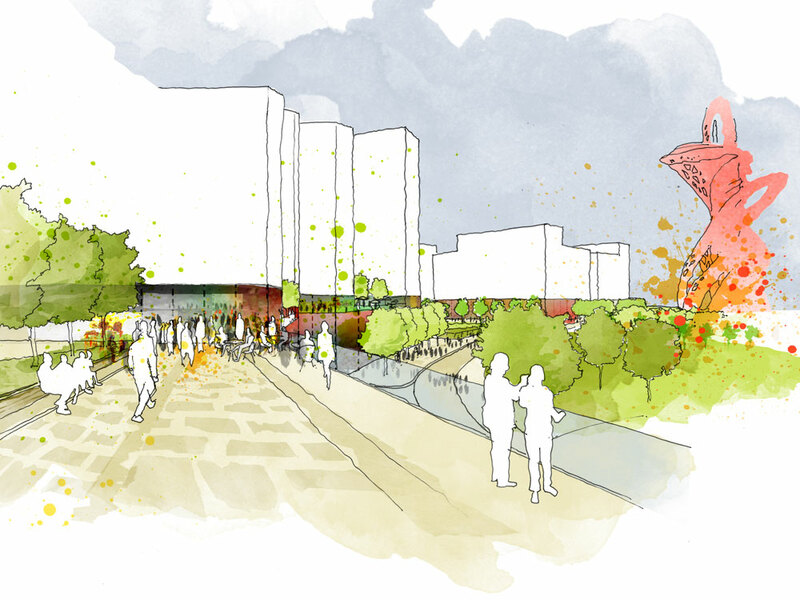 The Mayor of London has granted outline planning permission for UCL East - a key milestone in UCL's plans to create a vibrant new university campus on Queen Elizabeth Olympic Park. Submitted at the end of May 2017 by the London Legacy Development Corporation (LLDC) and UCL, the application followed consultation on UCL East from summer 2015 to winter 2016. At the end of 2017, there was a unanimous resolution from the LLDC Planning Decisions Committee to grant outline planning permission for UCL East, subject to finalisation of planning conditions. "UCL East is a key part of our long-term strategy to maintain our position in the world's top 10 research intensive universities and provide students with a world-class, research-based education. The project is being directed by academics for the benefit of our intellectual community and we are thrilled to celebrate this key milestone," said Professor Michael Arthur, UCL President & Provost. "We are a significant step closer to facilitating the pioneering, engaging and cross-disciplinary activity we have planned for the site, which has a strong focus on public access and engagement, and we are grateful to the Mayor's Office for their support in achieving this." UCL East is part of a major regeneration development that aims to transform the area and bring educational, cultural and economic benefits to local communities. As a founding partner of the cultural and education district (CED), UCL will be located alongside some of London's most prestigious institutions, including planned new spaces for the V&A, London College of Fashion (part of UAL) and Sadler's Wells. Mayor of London, Sadiq Khan, said: "I'm delighted to grant outline planning permission for UCL's exciting new campus at Queen Elizabeth Olympic Park. UCL East promises to build on UCL's reputation as a world-leading education and research institution and will sit at the heart of a new culture and education district in Stratford. As this new development takes shape it will cement London's reputation as the best place in the world to study, work and visit." "The masterplan for UCL East is intended to change the way we think about the relationship between city and university. Its ambition is to be inclusive and welcoming to everyone and to harness the power of the public realm to encourage collaboration and exchange. We think by creating this new kind of place, where buildings and spaces share the same sense of openness and accessibility and where people can mix, then great things can happen for the University and for the local community," said Bernie Foulkes, Board Director at LDA Design. UCL East will ultimately provide around 180,000 square metres of new floor space (equivalent to 25 Wembley football pitches), adding approximately 40% to UCL's central London site in Bloomsbury. The mixed-use building is being designed by a Lifschutz Davidson Sandilands-led team, appointed in 2016. It comprises a three-storey academic podium above which there are two towers of 13 and 17 storeys, containing around 500 bed spaces for student accommodation. At the intersection of these two uses is a landscaped terrace that provides a social space for residents and academics to meet. The central atrium is designed to be open to members of the public. Pool Street West will house the Future Living Institute: a multi-disciplinary home for research, innovation, teaching, and engagement from at least five faculties. It will be home to new research labs and taught programmes. The academic research, innovation and teaching facility is being designed by a Stanton Williams-led team, appointed in 2016. The building includes a range of state-of-the-art research laboratories, enterprise and translational research spaces, group-working spaces, design studios, making spaces, student-led and high precision fabrication workshops, and exhibition spaces - with the design focused around collaborative social and working areas. These will promote inter-disciplinary working and interaction between teaching and research, staff and students, academics and members of the public. The lower levels of the building are characterised as a network of public spaces and activities which draw the public into the heart of the building, blurring the boundaries between interior and exterior. Externally, the scheme extends the activities of the building into a new landscape setting to provide an animated public realm which engages with the activities of the park and the surrounding community. Marshgate I will be the centre for the academic vision, uniting Experiments, Arts, Society, and Technology (EAST) across research, innovation and taught programmes. Sir Peter Hendy CBE, chair of LLDC, said: "This is a great step forward in creating one of the most innovative education hubs fit for the 21st century, right in the heart of Queen Elizabeth Olympic Park."